The last time I saw Radiohead was in a large outdoor amphitheatre (White River, Aug 2008), and I’ll say the move to indoors was much appreciated. This was my first time to Key Arena. Pretty basic arena… stage set up at end. I arrived just as the opening band was wrapping up… the TicketMaster/Radiohead paperless ticketing was great from a no-scalpers perspective, but it took a bit longer to file everyone in timely. 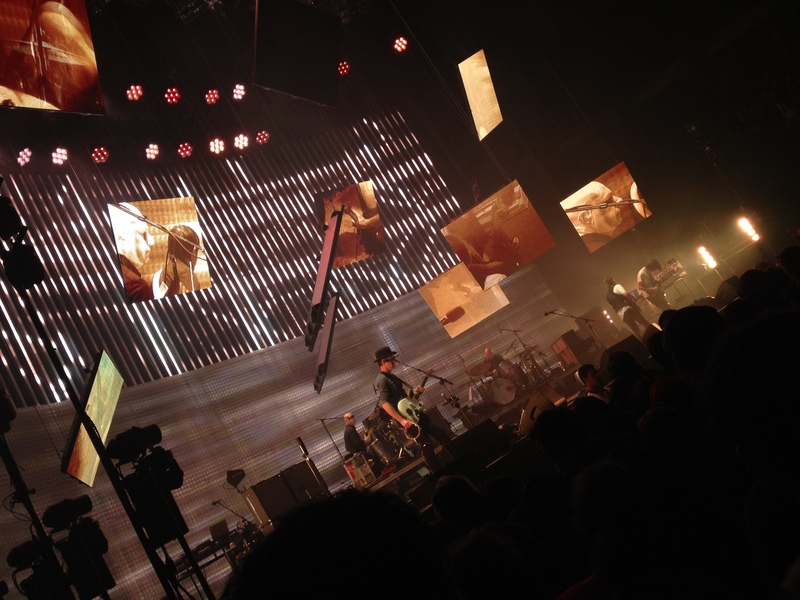 Radiohead started off the set with “Bloom,” featuring the double drum set-up with both Phil Selway and touring member Clive Deamer (from Portishead) in addition to Jonny Greenwood on a small drum kit. Jonny hit the mini-kit again (along with Ed O’Brien) for “There There” later in the set. The light show was a LED wall behind the band with moving, suspended video screens (see photo above and slideshow below). The moving video screens had been slowly coming down on the band until they were under an archway of lights by the time “Airbag” came around. Ed make a half-hearted leap to hit the screen above him with his hand. Check out more RH tour dates below. Next show for me… Glen Phillips (of Toad the Wet Sprocket) in Portland 4/12.